You may not realize this, unless you are a writer yourself (many of us are), but every sentence I put down on this page goes through a process of inquiry and critique. That doesn’t mean each sentence is perfect. Far from it, but each sentence must ring true for me, and just about every sentence is followed by the thought, is that what I mean? Often I wonder what assumptions are driving my point of view. I strive to have these sentences reflect the values I hold. I strive to connect intellectually and emotively with an imaginary reader, putting myself in their place, wondering if these words might help. Mostly however, that work of imagining another reader falls away and I write for myself, hoping that resonance is created for other readers, because, after all, we are mysteriously connected to each other. I write about my writing now because the next lunar cycle, seeded by the sign of Virgo, is an opportunity to look at process, recognize expectations, wonder about assumptions, and critique effectiveness. If that doesn’t sound like fun to you, then prepare yourself for additional pressures to be perfect this month. It can be stressful. We are at a critical juncture in development. Transits from planets in mutable signs this year (Jupiter in Virgo, Saturn in Sagittarius, and Chiron and Neptune in Pisces, augmented by Mars in Sagittarius and the personal planets swarming in and out of mutable signs to trigger shifts in consciousness) have been nudging the ways we perceive and communicate, absorb and transmit. What has surprised me about this emphasis is how stressful it can be. We are complex creatures. Sensory, emotion-based information has the ability to bring up memories and traumas linked to the past. Our animal brains respond with freeze or fight messages, which can show up as not knowing what to do or feeling like we need to do a lot. Notice whether this happens to you during the next lunar cycle. As I have been learning about trauma, I’ve found a few resources you may also want to check out. There will be a lot to pay attention this coming lunar cycle (September 1 – September 29.) Much of it involves the mutable signs. Two eclipses: A solar eclipse at the New Moon at 9 degrees Virgo and a lunar eclipse at the Full Moon on September 16. The third and final exact square between Saturn in Sagittarius and Neptune in Pisces occurs on September 10. Jupiter leaves Virgo (after being in that sign for one year) for Libra on September 9. These transits represent turning points—potential crises—but also moments of illumination and healing. Don’t be surprised if events this month feel bigger and more important than usual. And, give yourself some love, if it all seems too much. With this awareness, I prepare myself for a period of listening to the messages I am receiving and assessing the messages I am sending. The intent is not to achieve perfection or some kind of guarantee that I will protect myself from discomfort by being vigilant enough. My intention is: to be open and resilient; ready to fine tune my work but also forgive myself when I don’t meet my expectations; and to be curious about what I might discover. Forecast for August 29, 2016 – September 11. Monday, August 29. Stationary Mercury conjoins Venus in the last degree of Virgo. Mercury will station retrograde tomorrow. All week, Mercury in one of the signs it rules, will be making itself known in a big way. Today, Venus starts the pattern. Mythologically, Mercury is the same as Hermes. Hermes is a doorway god. He invites, challenges, and marks those liminal places where we cross a threshold. Venus crosses a threshold from Virgo to Libra today. Mercury waits there to make sure we pay attention. Mercury’s method, as a trickster god, can be to disrupt the ways we think things should go. Disruption could happen in the Venus realms of relationship, justice, art, and money. As you go through doorways today, notice those moments that ask you to rethink. We are being given a gift of flexibility and adaptability. Pride might be part of the lesson plan with the Moon transiting through Leo. Tuesday, August 30. Feel those mental brakes screeching to a halt. Mercury in the last degree of Virgo stations retrograde today. During this retrograde, Mercury will conjoin Jupiter for the second time. And when Mercury conjoins the Sun in the center of the retrograde journey, it will form a square to Mars in Sagittarius. The sense I get from this agenda is that Mercury wants us to reflect on our beliefs and our actions. How does belief (Jupiter’s domain) influence our actions (Mars’ domain)? How can we support belief by action? Now, Mercury’s method of encouraging reflection is usually by messing up the ways we think things should go. Setbacks, disruptions, and surprises are his specialty. We get bonus points if we can laugh our way past expectations for perfection. The Moon in fiery Leo makes a trine to Mars and Uranus in Aries today. It may be hard to slow down. Notice what happens when you don’t. There is a lot we want to get done. Does speed always help? Wednesday, August 31. The Moon enters Virgo, and then we think about it. Or somehow unconsciously respond to that Virgoness. This is the only aspect today, but not the only influence. Mercury is still stationary. (Turned retrograde yesterday at the very last degree of Virgo). A New Moon/Solar Eclipse in Virgo happens tomorrow, along with several other transits involving the mutable signs of Virgo, Pisces, and Sagittarius. But today, we get to feel into Virgo itself. Mutable earth—a paradoxical concept combining the solidity of earth with the changeability of the mutable mode—is the guide for the next month. Perhaps the tension forces us to get busy creating more order. House cleaning can be a wonderful way to release this tension. As this is the last day of the Leo lunar cycle, getting rid of clutter is a great way to prepare for a new beginning. 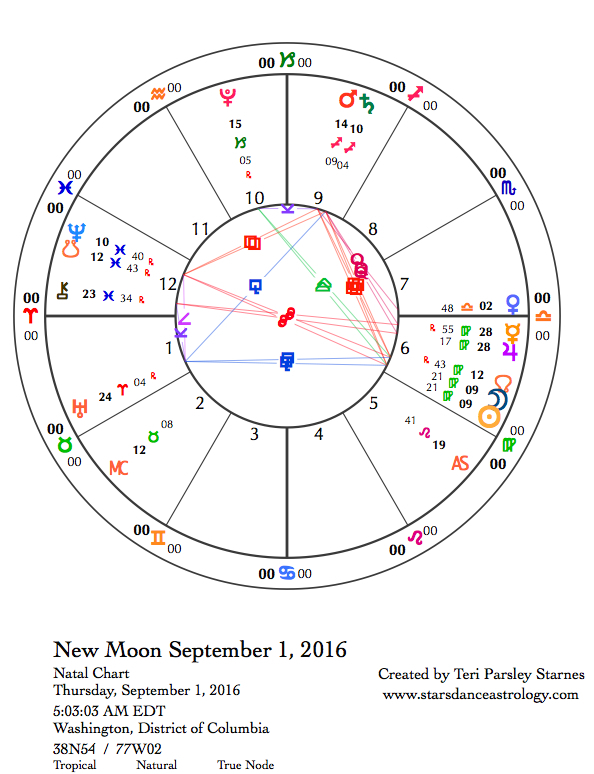 September 1—New Moon: Dreaming. Solar Eclipse. What Virgos love: ingenious systems, work that serves, analysis, doing what you say you will do, sharing the load, healing, integration, discernment. I am not a Virgo, though as an astrologer it is my job to have a list of keywords and ideas for each sign. I am not a Virgo, but I hold this sign in such high esteem, sometimes I wonder if I am piling on too much when I describe the gifts and shadows of this sign. I invite those with Virgo emphasis in their charts to let me know what you think. There is so much to do in this season. In the Northern Hemisphere, it is the end of summer. The season’s metaphor tells me this sign is busy bringing in the harvest, discerning what is best used now and what is best kept and organized for the coming winter. The integration work of summer, oddly enough, is concerned with being helpful, pragmatic, and effective. If we’ve been given a lot in the season of abundance, we better do something useful with it. This can bring a load of pressure. That is the demon Virgo wrestles with, being satisfied with a good enough job. My philosophy is that we need to develop skillfulness around each of the signs, regardless of whether those signs are emphasized in our charts. This is why I practice mindful intention at each New Moon. Through the course of a year, I will have set intention for each sign and observed myself through that lens. Even though I am not a Virgo, I get to become a little more Virgoan this month. You can too. This New Moon has unique power. There is a Solar Eclipse. The Moon moves in front of the Sun at 9 degrees Virgo. This happens to closely oppose Neptune in Pisces at 10 degrees Pisces and squares both Saturn and Mars at 10 and 13 degrees Sagittarius respectively. Mercury is retrograde in Virgo to boot, while conjoining Jupiter at the end of its year-long transit through Virgo. It all just feels so darn auspicious, which is a funny word when one thinks of the naturally humble sign of Virgo. Big stuff is brewing. Notice your passions. Virgo is a sign of devotion. It can selflessly serve the ideals that it wholeheartedly believes in. There is opportunity to do shadow work around our passions and devotions this month with two eclipses occurring, both today and at the Full Moon on September 16. Shadow work means looking beyond the obvious to what we might want to hide or might be afraid to acknowledge. The shadows can hold gifts. Often we stop ourselves from claiming those gifts due to assumptions or cultural programming. The Saturn/Neptune square that has influenced our collective assumptions for at least the last year makes its third and last exact connection on September 10. I’ve seen many people respond to this transit by investigating the conditioning of racism. There is a strong opening right now to see past the beliefs that support white supremacy into a different story and relationship between people. Dismantling thought patterns that support injustice, greed, and destruction of our ecosystems is not an easy task! What if the eclipses, along with Mercury’s retrograde, were an opportunity to reboot our stories? I ask myself, how can I be the most daring I have ever been, while serving the ideals I most believe in? That is a Virgo intention. Squares and oppositions mean there will be challenges. Some of them will be health-related. The conjunction between Saturn and Mars is a classic example of needing to tend energy resources. We will most likely have to move slower than our passions desire. Mercury in retrograde will somehow make it harder to do the very things we care most about. This could be a time to look at self-expectations. Mercury loves a good sense of humor, even when we are saving the world. The conjunction between Mercury and Jupiter is fraught with lessons in humility, while at the same time daring to be bigger in our devotions. The planets seem to be saying, show up to make a difference, even when there are no guarantees. It isn’t about any one of us. We each get to take our tiny steps towards a better collective vision. Wow. I’m ready. How about you? Friday, September 2. 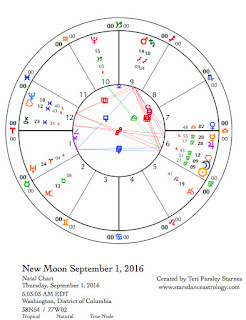 See yesterday’s New Moon forecast for information about today. The Moon continues in Virgo for most of the day (Central time zone). The Sun in Virgo exactly opposes Neptune in Pisces. Mercury retrograde exactly conjoins Jupiter in Virgo. The Moon joins them both. Sun/Neptune activates our hearts to feel more empathy while wanting to save those who suffer. This is wonderfully altruistic, yet these feelings can be taken too far. That is the nature of an opposition. Where do we need to pull back into balance? The Mercury/Jupiter connection makes things bigger. One of these things could be expectations for perfection or resentment about how much we do for others. In the end, this aspect encourages us to pull back our expectations. Small steps are truly powerful. Honor those steps, then maybe get a massage. Saturday, September 3. Finally the Moon moves into a cardinal sign. We may be feeling a need to stop all this self-reflection and just get on with it. Venus in Libra conjoins the Moon. This is a wonderful aspect to take in the arts, to create and appreciate harmony, to participate in gracious social environments. The underbelly of all this pleasure comes from the square between the Moon and Pluto in Capricorn. Injustices goad us. You might want to do something about it. Sunday, September 4. This is another day to take in experiences of beauty and harmony. Today, the Moon in balancing Libra opposes Uranus in Aries, triggering a need to do something about injustice or imbalance. An encouraging sextile aspect between the Moon and Mars in Sagittarius supports our actions. After this holiday weekend (Labor Day in the U.S.), it will be time to get down to business. Use the energy to mentally prepare yourself. September 5—Crescent Moon: Beginning. This lunar cycle, seeded in the sign of Virgo, has already been influenced by significant celestial events over the last week. Mercury stationing retrograde in Virgo and a solar eclipse are just two of the most noticeable. This phase of the Moon is when we begin in earnest to manifest our lunar intention for the month. As we witness the new crescent Moon right after the sunset, we can take encouragement that this beginning will be a good one. What are your plans for the fall season ahead? You may be feeling eager to get to work. Virgo is a hard-working sign. It asks us to tend to the pragmatic details of any act of service or work. What are you devoted to? What skill will you hone as you commit to service to that ideal? The energy of probing our deeper layers in order to prepare for new work comes from the Moon’s transit of Scorpio today. Don’t be surprised if you are feeling less social on this holiday. The real focus may be on our interior lives. Tuesday, September 6. Death makes life more precious. That may be a strange thought for a Tuesday following a holiday weekend, but there is support for that thought today with the Moon in Scorpio making favorable aspects to Neptune in Pisces and Pluto in Capricorn. Of course, we may be feeling the surge of industrious energy with so much influencing us from Virgo right now, but we might also be moved to slow down to contemplate the nature of life and death. What makes your work meaningful? Wednesday, September 7. It feels like a cliché, but I’ve seen it many times. Strong Venus transits often call attention to women and women’s issues. Venus is strongly placed in a sign that it rules, Libra. Today Venus makes a favorable aspect to Saturn in Sagittarius and a challenging aspect to Neptune in Pisces. There may be people who want to bring confusion to issues of gender justice, but there is also support to bring a message or action forward. Libra is about more than beauty and harmony. The sign of the scales is on a mission for justice too. The Sun in trine aspect to Pluto increases the power of this day to cut out the crap. Be brave and bold as you move toward justice. Thursday September 8. We re-enter the mutable zone with the Moon in mutable fire sign, Sagittarius, making aspects to Saturn in Sagittarius and Neptune in Pisces. Saturn and Neptune are two days away from the third and final exact square. With the Moon’s help, we see examples of what this transit is about. Since these outer planets influence the collective experience, we have to look at the broader issues in the world. Water issues, refugees crises, fundamentalism, and racism are such issues described by this turning point transit. Even as we take hope that people are coming out from under the spells of greed and hostility, we see evidence in social media that people are more polarized and willing to be hateful towards each other than ever. The Virgo mission of this lunar cycle may have us asking, what more can I do to shift the tide towards love? September 9—First Quarter Moon: Manifesting. (See yesterday’s forecast for a description of today’s influences.) The First Quarter square is when we really start to notice our challenges in manifesting lunar intentions. The challenges bring gifts and breakthroughs. We have to expand to take in more information. Options increase, but also the desire to give up. There’s a lot going on today, I suspect we will feel less like giving up and more like getting on with it. Jupiter leaves Virgo behind to transit through the cardinal air sign, Libra, for the next year. It is as if some tension we’ve been holding around self-assessment and critique is suddenly let go and we dive right into the beauty of collaboration, making art, and working for justice. The Moon in Sagittarius, for all its challenges to get clear right now, embraces a sense of freedom in this shift. Freedom (Sagittarius) and service (Virgo) need to go hand in hand through the rest of this cycle. It feels like a big contradiction. But an interesting one. Retrograding Mercury in Virgo makes a paradoxical aspect to Uranus in Aries. There is a huge unpredictable, tricksterish quality to this influence. It pays to be clever to get what you want and what you need in service to your devotions. The Moon activates Mars in Sagittarius and Uranus. Unexpected impulses move us forward even if we have to backtrack a bit to recover. Saturday, September 10. In November 2015, Saturn in Sagittarius made the first of three squares to Neptune in Pisces. Today, is the last time these two planets make this particular aspect to each other. The next time they are in waning square will be in about 36 years. The relationship between these outer planets describe current events and challenges of the moment. Much of the most difficult transits of the last few months have involved these planets. What have we been noticing? The fairytale about the Emperor’s new clothing comes to mind. Collective assumptions color our perceptions. If we notice that our stories aren’t serving us, then how do we see beyond the assumptions? This feels like the work of this waning square. In 1989, Saturn and Neptune conjoined to begin this current cycle. That year, the world experienced the protests in Tiananmen Square and the fall of the Berlin Wall. Something new was in the air related to liberation and shifts in political forms. Collective stories were molded by collective beliefs. Much of that idealism has been shown to be false hope, and yet, we still strive to expose falsehoods in our collective stories. The waning square is the part of the cycle where we get to be critical of what has gone before, even if we still have the same intentions. We are learning to see the stories being told in the media, in our schools, and in our national myths that do not serve us. The Moon in Capricorn gives us the ability to look with a critical eye at where we have been and what it will take to get where we want to go. Sunday, September 11. Remember Venus in Libra and her concern with gender justice? That issue is likely to come up today with a square between Venus and Pluto in Capricorn. The Moon conjoins Pluto, making this even more likely to be a day of exposure and anger about injustice. The earth energy of Capricorn and Virgo will help us focus anger into productive action.